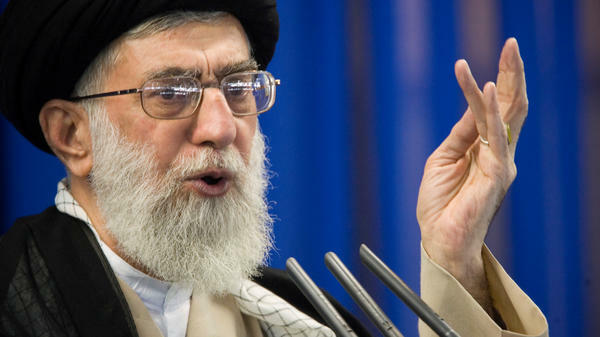 Supreme Leader Ayatollah Ali Khamenei said a "cowardly attack" at a military parade in Iran over the weekend was carried out by a separatist group supported by the U.S. He's seen here speaking in Tehran earlier this month. Soon after the attack, the U.S. State Department issued a statement of sympathy to Iran, calling out what spokesperson Heather Nauert called "the scourge of radical Islamic terrorism." Nauert added, "The United States condemns all acts of terrorism and the loss of any innocent lives." But citing "reports" by Iran's government, the ayatollah said Monday that "the cowardly attack was committed by those who are rescued by the Americans whenever they are locked in Syria and Iraq, and they are financed by Saudi and Emirate's money," according to the state-run IRNA news agency. Khamenei's remarks came as several Iranian generals took tough tones to accuse the U.S. of involvement in the weekend attack in Ahvaz, Iran. The senior commander of the Islamic Revolutionary Guard Corps, Brig. Gen. Esmayeel Kossari, said the reactions in Saudi Arabia and the United Arab Emirates – along with "documents" that he said had been found in Iraq and Syria — were proof that "the Americans gave orders to Riyadh and supported this attack." He was quoted by Iran's FARS news agency. The high-level military officers also warned that Iran will seek revenge. "We promise to show an annihilating and destructive response which makes them (the culprits) regret their deeds and no one will be able to kill our children in this territory, and this will not be the end of the story and we warn everyone that we will take revenge," said Brig. Gen. Hossein Salami, the Revolutionary Guard's lieutenant commander, according to FARS. Speaking at a funeral ceremony for people killed in the attack, Salami also referred to an exchange of accusations between Iran and Israel over attacks this past spring, saying, "The Americans should know too and we warn them. The U.S. has failed to establish security for the Zionists and now Hezbollah is able to annihilate the Zionists." The rhetoric between Iran and the U.S. became more bellicose in July when Rouhani declared that "peace with Iran is the mother of all peace, and war with Iran is the mother of all wars" and Trump shot back with an all-caps tweet warning of "CONSEQUENCES THE LIKES OF WHICH FEW THROUGHOUT HISTORY HAVE EVER SUFFERED BEFORE" if Iran should "THREATEN THE UNITED STATES AGAIN." About a week later, Trump said he'd be willing to meet with Iran's leaders, including President Hassan Rouhani, at "any time." However, Iran's leadership responded by saying the time for talks should have been before Trump withdrew the U.S. from the Iran nuclear deal in May. Both Trump and Rouhani are attending this week's U.N. General Assembly in New York. Over the weekend, Secretary of State Mike Pompeo told Fox News that "if there are constructive conversations to be had with the Iranians, the president is happy to have them." Pompeo added that it's Khamenei, not Rouhani, who controls Iran. When asked whether that meant Trump would be willing to sit down with the ayatollah, Pompeo replied, "The president said he'll talk with anyone if we can have a constructive conversation." The U.S. wants Iran to "stop being the world's largest state sponsor of terror," Pompeo said, adding, "But make no mistake about it, they have no intent of doing this." On Friday, the day before the parade attack, Rouhani wrote an opinion piece for The Washington Post in which he said current U.S. policies toward Iran are "out of step with the realities on the ground — in Iran, in the region and around the world." Rouhani is now in New York, feeding speculation that he might take part in some type of meeting or session with Trump. Speaking to a group of American journalists on Monday morning, the Iranian president seemed to suggest that was unlikely, highlighting the dispute over the 2015 nuclear deal. "Trump has in fact carried out some very wrong actions against Iran and the Iranian nation," Rouhani said, according to IRNA. "He unjustifiably quit the deal, threatened the Iranian people for no reason and intervened in our internal affairs. Before any discussion, these false actions must be compensated."